One of the largest collections of trusted party and holiday appetizer recipes on the internet. This Caviar Index includes my wonderful and delicious appetizer recipes using caviar. The recipes are very easy to follow and will give you delicious results. Check the recipes out, prepare them for your family and friends, and ENJOY the compliments you will receive! Learn how to purchase and use American Caviar. A delicious way to serve caviar. By putting it into this easy-to-make spread, you actually “stretch” your party budget. 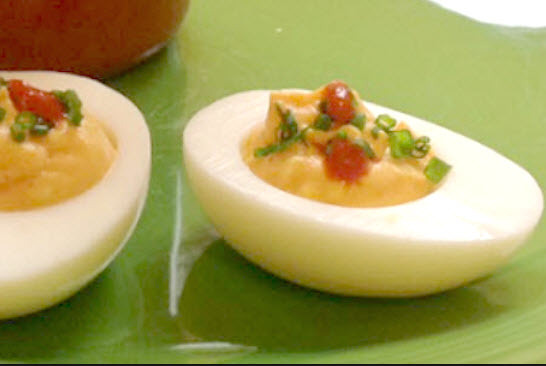 Dress up you deviled eggs with caviar and impress your guests! Caviar Plate – The Classic way to serve caviar. This appetizer is always a crowd pleaser. Everyone loves it! Great make-ahead dish for your Holiday Open House. Smoked salmon and caviar are a natural combination for a gourmet appetizer. This is a very easy-to-make, but very gourmet, appetizer or starter dish for the “grandest” of affairs. Smoked salmon and caviar are a natural combination for a gourmet pizza. This is a very easy-to-make, but very gourmet, appetizer or starter dish for the “grandest” of affairs. What makes this recipe even easier, is making the bread dough in your bread maker. You can even really “cheat” on this recipe by buying purchased frozen pizza dough. Another easy way to serve caviar without spending too much money. This wonderful recipe was sent to me by Ruth Colson who lives in Launceston, Tasmania, Australia. Stuffed eggs are always a favorite at any gathering. Add some caviar, and you’ve added a touch of elegance! This is a wonderful way to serve caviar to people who have never tried it before. This recipe always wins everyone to the delights of caviar.